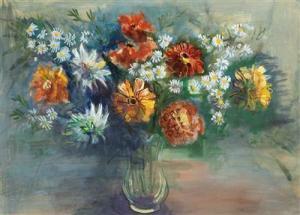 Find artworks, auction results, sale prices and pictures of Jean Dufy at auctions worldwide. 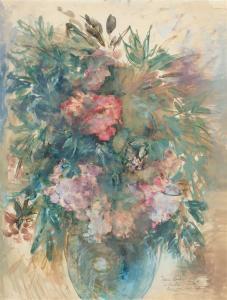 Sale 171 Lot 26 **Jean Dufy 1888-1964 (French) Vase de fleurs watercolor and gouache h:56 w:43 cm. signed and dedicated 'a Madame Bioller, bien amicalement' lower right Other Notes: Accompanied by a certificate of authenticity signed by Jacques Bailly, dated March 8, 2017, numbered 4591. Location: Europe. 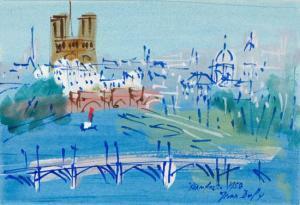 Jean Dufy 1888 - 1964 French Paris, La Passerelle des Arts gouache and watercolour on paper signed, dated 1958 and inscribed "Bonne Année" and on verso titled Notre Dame et la Seine, Paris on the Dominion Gallery label and inscribed with framing notes 6 1/4 x 9 in 15.9 x 22.9cm Provenance: Dominion Gallery, Montreal Private Collection, Edmonton Jean Dufys birthplace was Le Havre, France, and his brother and mentor was the renowned Fauve artist Raoul Dufy. Jean moved to Paris about 1912, and here he became acquainted with luminaries such as the artists Pablo Picasso and Georges Braque and writer Guillaume Apollinaire. After military service and work in a textile painting studio in Lyon, Dufy was back in Paris by 1920, settling in Montmartre. Dufy continued to visit Le Havre. He traveled throughout Europe, England and North Africa and spent many years on a farm near Nantes, but the city of Paris was his enduring passion. Paris, La Passerelle des Arts, with its cool and refreshing blues and greens, laid down with light and transparent brushwork, is an outstanding example of his depictions of Paris. Dufys graceful paint-strokes outline the essential features of Notre-Dame Cathedral and one of the Seine Rivers many bridges. This lot is accompanied by a photo-certificate of authenticity signed and sealed by Jacques Bailly and titled and dated Paris, June 14, 2018, with a note that this work will be included in the forthcoming catalogue raisonné on the artist's works, certificate #4686. 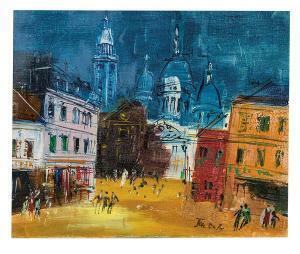 Lot 28: Jean Dufy L'église Saint-Pierre de Montmartre et le Sacré-Cœur c. 1954 Oil on canvas Signed lower right edge of canvas; retains Schoneman Galleries label canvas stretcher verso Canvas: 15.125" x 18.25"; Frame: 25.625" x 28.75"; (Canvas: 38 x 46 cm) Provenance: Bears Schoneman Galleries, New York, New York; Sotheby's, London, United Kingdom, February 6, 2001, lot 264 Illustrated: Jean Dufy: 1888-1964. Vol I. J. Bailly. 2002. #B.349. 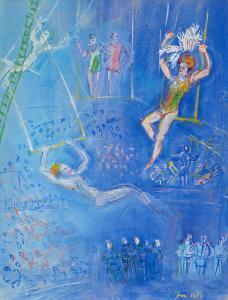 JEAN DUFY (1888-1964) Les trapézistes signed 'Jean Dufy' (lower right) gouache on paper laid down on card 24 x 18 1/4 in (61 x 46.4 cm) Footnotes This work will be included in the forthcoming third volume of the catalogue raisonné being prepared by Jacques Bailly. Provenance Acquired by June 1947.